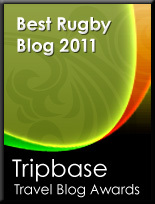 TOTAL FLANKER...a rugby blog: Citius, Altius, Fortius? Thanks to the World Masters Rugby Group for drawing my attention to the IRB's continuing campaign to persuade the International Olympic Committee to re-introduce rugby into the Olympic Games. Whilst I can see the benefits of rugby being an Olympic sport, namely that rugby would reach a new audience, both in terms of age and geography, and its inclusion would aid the sport's development in some of the smaller rugby nations (and indeed might force the Americans to start taking it seriously), I must admit that I also retain a certain amount of indifference to this potential development. Why? Well, primarily because what is being proposed is that sevens be adopted as the form of rugby to be played at the Olympics rather than the full form of the game. From a practical point of view this obviously makes sense - you simply couldn't shoe-horn a 15 a-side tournament into an Olympic schedule - but I can honestly say that the shortened form of the game leaves me cold. I hated playing it and, although I enjoy attending sevens tournaments for the beer and the banter, can't get excited by watching it. It simply does nothing for me. Another reservation I have is about one of the IRB's arguments for rugby's inclusion, namely that rugby reinforces the ideals of Olympism, thanks to rugby’s long-standing ethos of fair play and friendship. Hmm, personally I would have thought that "rugby's long-standing ethos of fair play and friendship" would be distinctly under threat from the Olympics whose ideals would appear these days to encompass cheating, corruption, commercial greed and the endorsement of abhorrent political regimes. I'd also be surprised if the USA really wanted rugby to be included in the Olympics again. I would have thought they would want to retain their title as reigning Olympic champions, having won the gold medal in 1924, defeating Romania and then France in the Final (only 3 teams entered). Furthermore, the fact that the Final finished in uproar, with one of the American reserves being laid out by a walking stick and the American anthem being jeered by the French crowd, should possibly serve as a warning to those proponents of reintroducing rugby into the Olympics. Ultimately, however, the benefits to the sport may well outweigh my negativity and, for those determined to make rugby's case for inclusion there is the opportunity to respond to the IOC's Virtual Olympic Congress. How can you do this? By clicking on this link - http://www.2009congress.olympic.org/ - have fun! Fair enough on your second point - bit of a throwaway line that - but I wonder whether funding for US Rugby might be more forthcoming if an Olympic gold medal was the ultimate reward? TF, I do think that your point is valid. I think one of the selling points of sevens rugby as an olympic sport is that the superpowers in sevens are NOT teams like the Russians, Americans, Chinese or Germans, who seem to haul away a good number of medals. I think because the "Usual suspects" are not powers in this sport might end up helping the cause with the IOC folks. Hey, I would rather watch sevens in the Olympics than rythym gymanastics, synchonized swimmming and synchonized platform diving-among others.